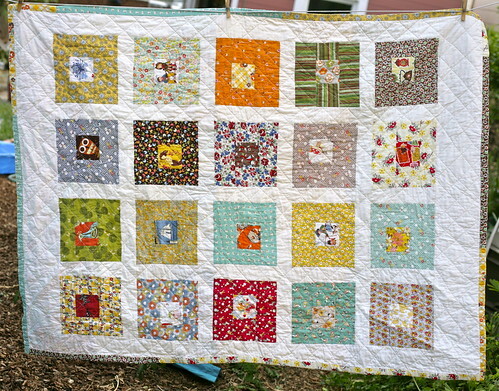 Inder Loves Folk Art: New old quilt. Whew! Things have been crazy 'round here. First of all, big house project: we are getting all of our windows replaced. And the front door! Yay, energy efficiency! Maybe this winter you won't have to listen to me complain about our freezing cold home and ridiculous heating bills quite as much? Won't that be nice? But whoa, living in a construction site with small children! What a mess. Total chaos. We're exhausted. Luckily, it should be completely done by this afternoon. 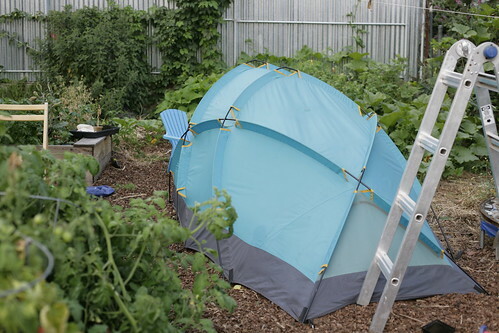 We've been spending a lot of time in this tent, which Steve set up in the backyard. A quiet retreat from the workers and noise. Joe has moved pillows, blankets, and books into the tent, and Maggie loves playing in there too. In moving furniture away from the windows for this project, I was forced to confront my "UFO/WIP" (unfinished object/work in progress) pile, which lives next to my sewing machine. Unlike some seamstresses, I generally don't have too many WIPs. I have my faults, but I usually finish my projects unless there is a serious hold-up ... or unless it's a quilt. Historically, I have not been speedy with quilts, primarily because I hand-quilted them (all two of them). 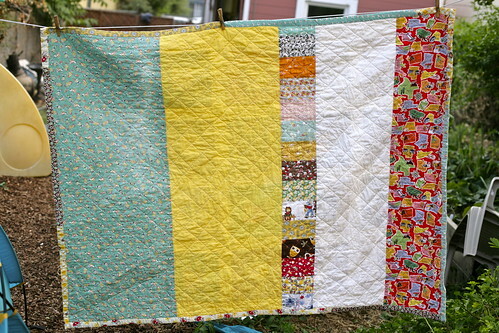 So one of the larger items in the pile was a quilt I started around three years ago. I'm not really sure when I started it, actually, but I can see it in my WIP pile in December 2010 (keeping a blog is handy for recalling things like this). Even then, it was completely sandwiched and basted. It just needed to be quilted. Moving it away from the window this past time, I noticed that the back of the quilt had faded in the light. Ugh. That's really bad - a WIP that has been sitting in one place untouched long enough to get sun damage, right? I opened it up, thinking maybe it was time to send this UFO to the trash bin, but when I saw the top, I still really liked it! Such a shame! So I got this crazy, crazy idea: Maybe I should finally finish this thing? By machine quilting, which I have never done before! In an all-over diagonal pattern! Right now. And I did. Over one evening and the next day, I finished it. The house was a huge mess, but sewing is one of my favorite ways to avoid cleaning, so it worked out perfectly. I quilted, while the kids reenacted The Lord of the Flies (kidding. sort of.). It was awesome! I know each quilt is supposed to have a story, but since I started this one so long ago, I really don't remember what its story is. I know I used this pattern, and the top came together very quickly and easily (with fussy-cut squares) and I made a fun pieced back for it. I always intended to machine quilt it, but at the time I pieced it, I was sewing with an older machine, and didn't have a walking foot. The idea of machine quilting totally intimidated me. So it sat, unloved, in a pile. For years. You can see the sun fading on the greenish strip at the far left. I've learned it's much easier to tackle a new skill when the stakes are pretty low. This faded and long-forgotten quilt turned out to be the perfect vehicle for learning how to machine quilt. Which was really easy and fast, by the way! Yes, my lines are a bit "organic" (this is quilting code for "sloppy"), and there are a few wrinkles and crinkles in the back, but overall, I was thrilled by how nicely this turned out, given my lack of experience. And it goes without saying that compared to hand-quilting, this went super fast. I still adore the look of hand-quilting and plan to hand-quilt more quilts in my life, but this makes whipping up a baby quilt for a friend seem like an achievable goal, rather than a three year project. It may represent a paradigm shift for me! 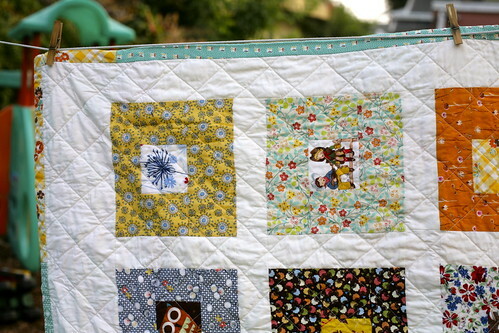 In the meantime, it's nice to have a quilt that isn't quite so fragile and precious. 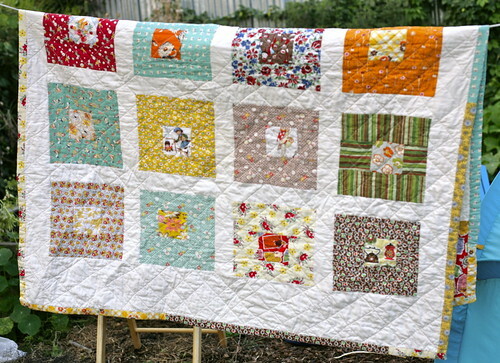 Even years later, I still have many of the fabrics I used for this quilt (I am such a hoarder!) so it was no problem digging a few out to use for a scrappy binding. So there you have it! My first machine quilted quilt, and a nice new/old quilt to take into the backyard tent. That's a gorgeous quilt, it must have felt so satisfying to finish it. I have far too many WIPs and one of them is my first quilt that was supposed to be a Christmas present last year - I'm hoping to finish it by this Christmas instead now. I hope everything has calmed down in your house now.